A very happy day of gluttony to you all! One of the scads and scads of things I am thankful for are all of you, my adored blog friends. My life is an even happier place because of each of you. 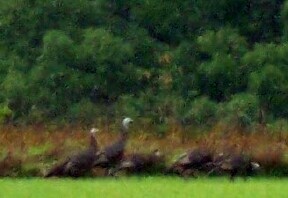 In honor of our splendid repast, I present a very fuzzy (because it was at the way-back of the back and taken from my bedroom window) picture of a band of wild turkeys of various ages trotting along the grass line, before hunting season, a few months ago. Happy Thanksgiving to the Piffle-bunch! I'm glad to hear you're full and your fridge is full too. Mmm, yummy! I wish I had leftovers but I go to my sister's inlaws house for Thanksgiving. I am now enjoying a Jimmy John's JJBLT, minus the T, with lovely, lovely extra B. So I don't feel too bad about not having the leftovers. Two pies! I love it. We always had two pies, but one of them was mince (ugh!!!! ), which my dad claimed to like but then never ate, horking all the pumpkin for himself and leaving the crappy mince for the rest of us. Speaking of pumpkin pie. Do you like to put tons of whipped cream on it? I do. Beth- Thanks! We are all fat and happy. Hope your holiday was lovely! Karen- If there is, I can't imagine what it'd be. Dana- While not the same as those traditional left overs, a JJBL(-T) can do in a pinch. Bacon is lovely, isn't it? Rozanne- You know it! I am all about the pie. Mince is just wrong. Your dad is devious. The whipped cream layer should be as high as the filling to achieve optimum bliss. You do have to eat it fast because if you dawdle, the whipped cream melts and that's just not right. Happy turkey day to you, as well! I wish this were my fridge right now! Our leftovers from Our Oct. We do the free range too. They're the juiciest! Thanksgiving are just a frozen carcass and a bag of meat I visit every now and then and think, "Oh yeah, when am I going to make soup?" I vowed when the first blizzard comes I will! Alas, it won't be for awhile yet...today is sunny and 11 C and we might even go out on our bikes! Crazy, eh? After my husband's already been on his skis twice! He sees wild turkeys when he goes running and skiing. Enjoy your leftovers and soup! You know, I can't help but feeling like a very nosy nate looking at your fridge. I'm not even looking at your leftovers but am instead attempting to decipher your various condiment bottles. Cagey- Hope your's was fabulous! A holiday all about food, indeed. Ruth- I have always envied your 2 months between Thanksgiving and Christmas. (Although, personally, if someone had asked me, I'd put Christmas and Hanukkah at the end of January, when we really need it. Plenty of time to prepare for it and enjoy the parties and when it was over, all we'd have to get through would be February and then we'd be at March, when spring starts.) I'm low on freezer space and will be making soup today or tomorrow, to be consumed post-haste. Crazy-warm here, too, all week! Babs- You, too? I also try to squint at the contents of other's fridges. Well, let's see. In addition to the feast leftovers: In the door, there's the Kikkoman lite soy sauce and the Lea and Perrin's Worchester sauce. Some yogurts at the back of the top shelf, by the foil-wrapped turkey carcass. The next shelf has buttermilk, a honey-mustard dressing, Paul Newman's sesame-ginger dressing, a beer, 2 jugs of local apple cider, and the top of an Oregon Chai tea carton. The various cream cheeses are peeking through the deli drawer, at the bottom. Of course, Teri could have told you all this. I'd imagine the beer is even the same, a bottle of the New Glarus Totally Naked, our Wisconsin brewery of choice. Teri- Now why do I not doubt a word of it? I've passed beyond being spooked at it and now just take it as a matter of course. If we should ever NOT match, I'd then be shocked. nah, in my fridge, the beer is the New Glarus Yokel...at least today. Teri- (gasp!!!) Now I am shocked! At least it's the same brewery. Charles bought it. Ruth- Heh. Used to be that the stores would wait until the day after Thanksgiving to put up the Christmas stuff, now they put most of it up around Halloween or a bit after. For me, I start putting mine up the weekend after Thanksgiving, in fact, I just got in from putting up our outside lights. We wore sweatshirts. It's 12C here (54F)! Sanjay- We've polished off all but the remains of the turkey. Sorry! How's about some soup? As one of the 2 out-of-towner relatives at the marvelous Thanksgiving dinner, I just want to say that it was even better than the leftovers bespeak. She even took a page out of Cathy's recipe book and added 1/4th cup of brandy to the pumpkim pie "fixin's". We heard the turkeys Saturday morning, but did not see any. 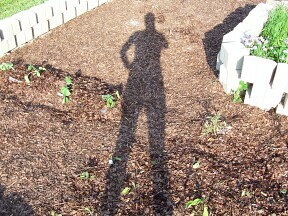 The weather was marvelous and we walked/ran most everyday. Happy Thanksgiving...hope you are enjoying the leftovers. Nothing better...Liked the turkey picture. For halloween we went to a farm on Sauvies Island for to go to a corn maze, and they had a petting zoo. Allie looked at the turkey and said "Enjoy your last month of life." Which I thought was macabre, but also hilarious. Happy belated Thanksgiving to the House O'Piffle. I was amazed at your neat, full refrigerator. You obviously don't have a teenage boy in residence. Our leftovers were quickly and untidily decimated by the ever foraging RT. Dad- It was a splendid time. The brandy pie seemed to be the favored one. Wonder why? Stace- Sounds like yours was great! We've never done a corn maze, which is odd as they are as common as, well, cornfields out here. Allie always has the right thing to add. Listie- Hah! 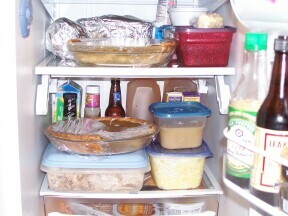 Fridge was cleaned out before the Thanksgiving descended. That shot was about 10 minutes after we'd put everything away. I'd forgotten I was going to snap a before and after of the mess.